Unless you have a specific academic or literary interest in 20th-century philosophy, it’s probably been years, if ever, since you’ve thought about the existentialists head-on, thinking of them as people or approaching existentialism as a topic to be learned. Yet their actual philosophy is always close at hand because it has so influenced modern culture, more so than you would estimate according to Bakewell. With this book, Bakewell seeks to close that gap in influence and attention, to make us revisit the existentialists, not only to appreciate their impact but also to take away new/ish approaches to contemporary problems. Bakewell’s approach combines discussion of the philosophies themselves with biography, written in a conversational tone. The title explains the reasoning for this seemingly informal approach to the topic: relationships among the existentialists and the conversations they would have together in cafes were vital to the development of their philosophy. Not only vital to it but also an embodiment of it, as a philosophy that focused on engagement with the world and other beings. 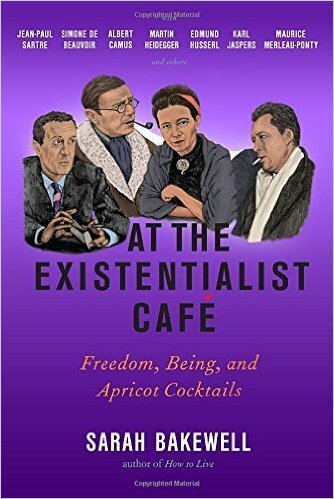 Thus the evocation we find in the subtitle, of Sartre, Beauvoir, and others, sitting around a table, sharing apricot cocktails. This book makes phenomenonology and existentialism accessible, and ‘accessible’ can sometimes denote “watered down”, but Bakewell does not dilute the actual content. She usually uses the same metaphors used in the source material, but takes the advice of Heidegger’s brother and does away with sentences that encompass entire paragraphs. Sometimes pop-sci books give the impression of being disrespectful to the researchers, the audience, or both. Bakewell avoids that by never “dumbing down” the work, only humanizing and historicizing it. She inserts herself lightly into these histories, a method she points out is appropriate given the beliefs and methodologies of the existentialists themselves. Sometimes she uses it to provide herself as an example of fangirl, to show exactly the kind of personal impact these ideas can have on real lives. In other cases, it’s to make explicit her own prejudices about the material. This entry was posted in Reviews and tagged existentialists, philosophy, sarah bakewell. Bookmark the permalink.